Fluvial Geomorphology studies the biophysical processes acting in rivers, and the sediment patterns and landforms resulting from them. It is a discipline of synthesis, with roots in geology, geography, and river engineering, and with strong interactions with allied fields such as ecology, engineering and landscape architecture. 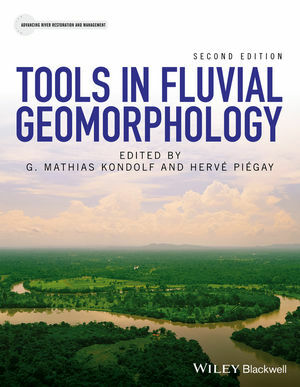 This book comprehensively reviews tools used in fluvial geomorphology, at a level suitable to guide the selection of research methods for a given question. Presenting an integrated approach to the interdisciplinary nature of the subject, it provides guidance for researchers and professionals on the tools available to answer questions on river restoration and management. Thoroughly updated since the first edition in 2003 by experts in their subfields, the book presents state-of-the-art tools that have revolutionized fluvial geomorphology in recent decades, such as physical and numerical modelling, remote sensing and GIS, new field techniques, advances in dating, tracking and sourcing, statistical approaches as well as more traditional methods such as the systems framework, stratigraphic analysis, form and flow characterisation and historical analysis. Covers five main types of geomorphological questions and their associated tools: historical framework; spatial framework; chemical, physical and biological methods; analysis of processes and forms; and future understanding framework. Provides guidance on advantages and limitations of different tools for different applications, data sources, equipment and supplies needed, and case studies illustrating their application in an integrated perspective. It is an essential resource for researchers and professional geomorphologists, hydrologists, geologists, engineers, planners, and ecologists concerned with river management, conservation and restoration. It is a useful supplementary textbook for upper level undergraduate and graduate courses in Geography, Geology, Environmental Science, Civil and Environmental Engineering, and interdisciplinary courses in river management and restoration. Professor Kondolf is a fluvial geomorphologist specializing in environmental river management and restoration. At Berkeley he teaches courses in hydrology, river restoration, and environmental science. His research focuses on human-river interactions, with emphasis on managing of flood-prone lands, managing sediment in rivers and reservoirs, and river restoration, and he has published extensively on these topics. He has served as advisor to US and state agencies on river management and restoration, and provided expert testimony before the US Congress, the California Legislature, and the International Court of Justice and International Court of Arbitration in the Hague. Professor Piégay is involved in integrated sciences for rivers, and works closely with practitioners, providing knowledge for river management, planning and restoration and methodological frameworks and tools, especially using GIS and remote sensing. As scientific director of the Rhône Observatory of Human and Environment Interactions, he leads an interdisciplinary scientific team conducting research on the Rhône valley, to inform management of the river, its floodplain, and tributaries. He has contributed to more than 200 papers in peer-reviewed journals and book chapters, and has coordinated several edited books.